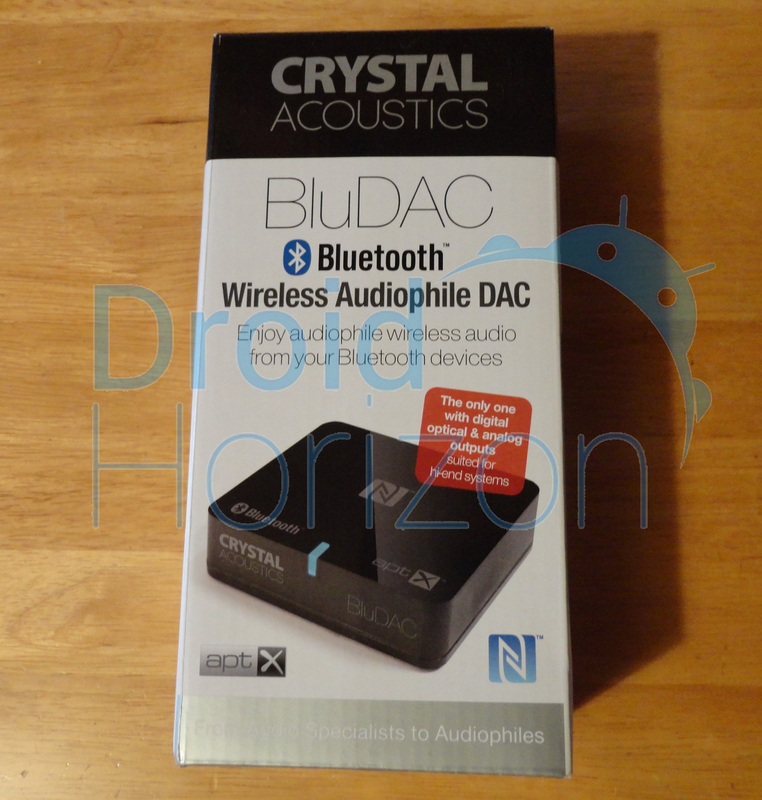 Right, first off we’d like to thank Dominic at Crystal Acoustics for sending us a BluDAC to review, it’s a relatively new bluetooth receiver, only available since June this year. 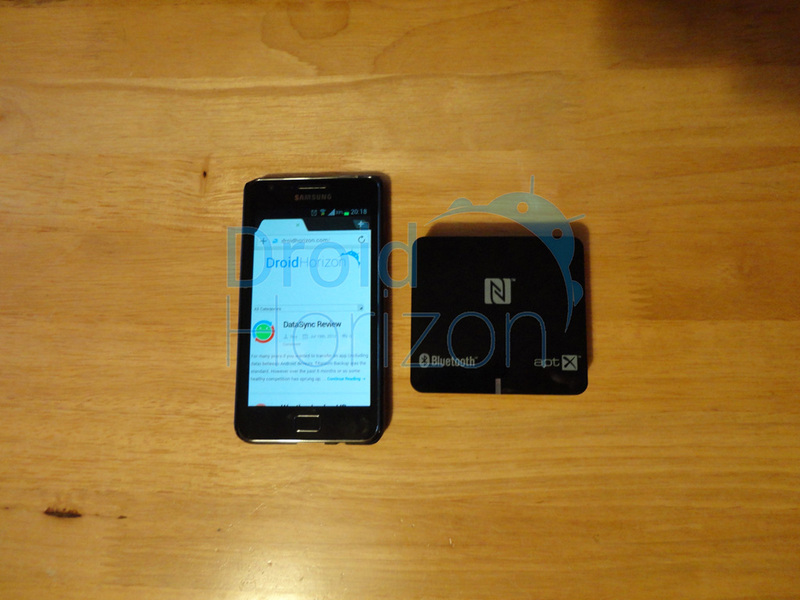 You may have noticed the NFC logo in the pic above, yes, the BluDAC has NFC pairing, and can remember 8 paired devices. It’s aptX® certified with both analog and digital outputs, much like the Betasphere Audio Beacon HR-120 Bluetooth Link I reviewed a couple of months ago. Indeed they have quite a lot in common, but more on that later. 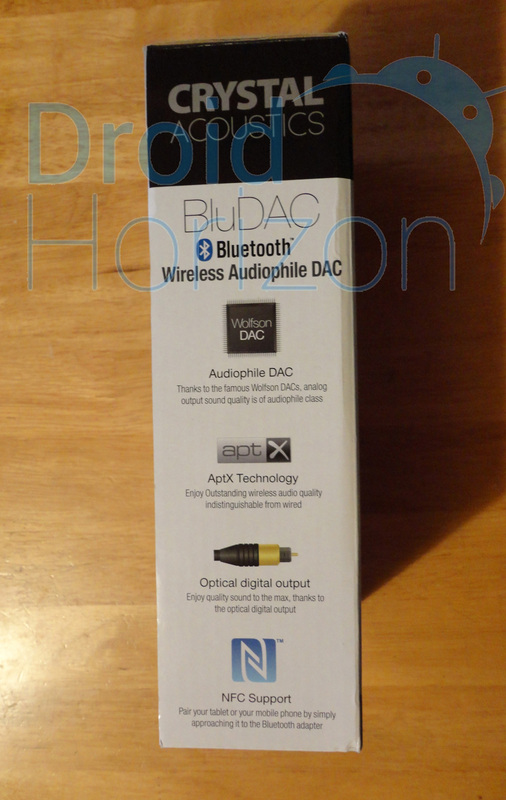 In the box you’ll find the BluDAC itself, the power supply, a 185cm length 3.5mm to 3.5mm cable, with a female 3.5mm to RCA adapter along with the usual instruction booklet. As is the norm, you’ll have to provide your own Toslink cable if you want to take advantage of the optical out, but if you don’t already have one they can be picked up for very little. 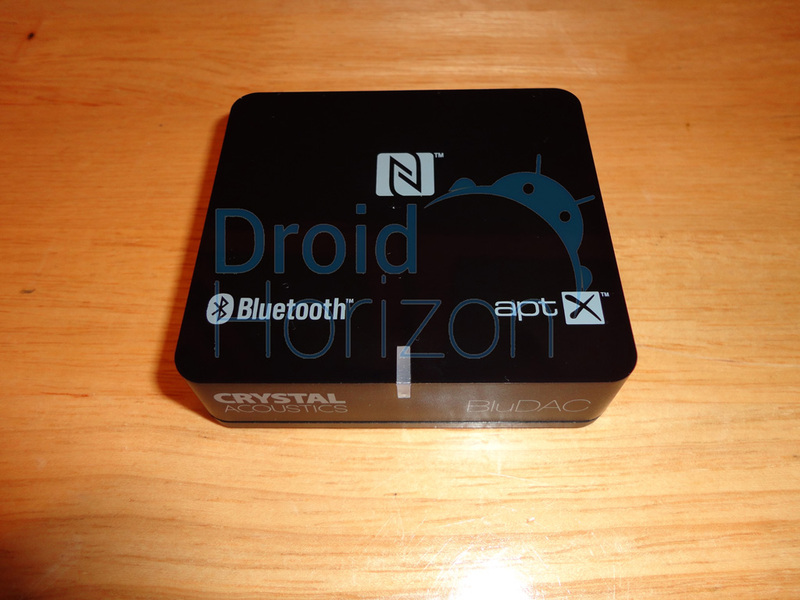 The BluDAC itself is 75 x 65 x 20mm, weighing in at 50g, with a claimed latency of 72msec. The packaging claims it’s “The only one with digital optical & analog outputs, suited for high end systems”. That’s not entirely accurate, digital outs, whether optical or coaxial seem to be becoming standard on these bluetooth receivers. And that’s a good thing, stereo amplifiers with optical inputs may not be overly common, but many households have an A/V receiver and they all have optical inputs. 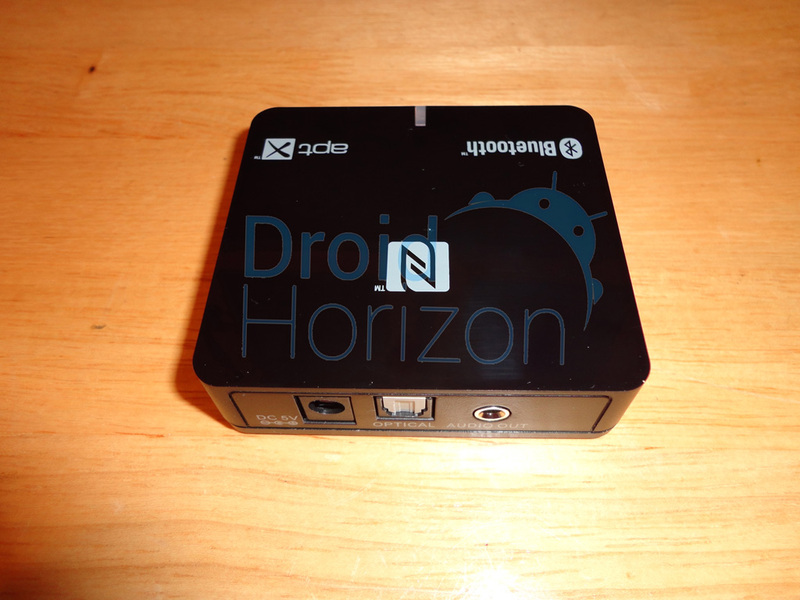 Quite impressive, as you would expect considering there is a Wolfson DAC inside this little box. For comparison’s sake I connected both the BlueDAC and the Betasphere HR-120 up to my Onkyo TX-8050 using both analog and digital outs. The speakers used were Wharfedale Diamond 10.1’s. The BluDAC was paired to my phone, the HR-120 to my tablet. Using GoneMAD Music Player on both sources “Love Theme” (.flac) from the Blade Runner OST was cued, cranked and played on a loop. 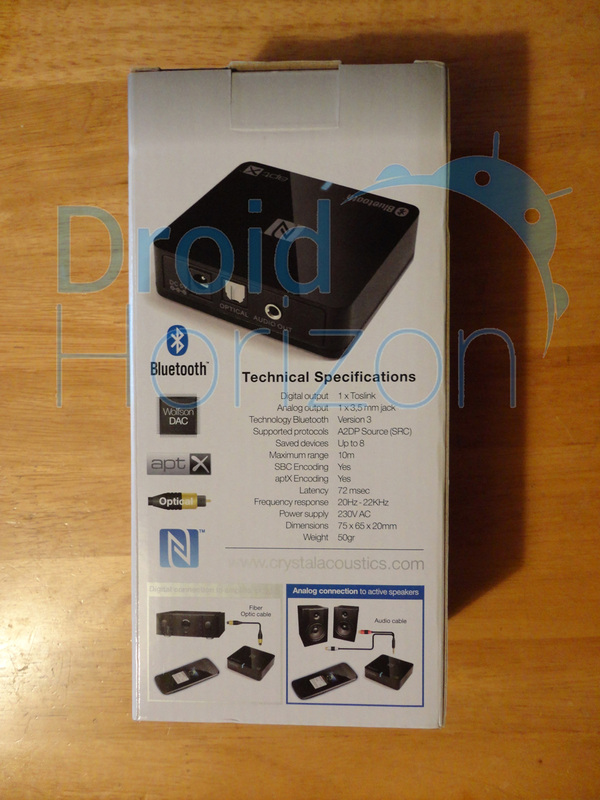 My mate Marty had dropped by to find out how the BluDAC performed, so this review has the benefit of two perspectives. Using the analog out the BluDAC has a precise sound, and a nice soundstage, and switching between the two I found myself preferring it over the HR-120. The difference was subtle but noticeable, for me, the BluDAC had the edge on detail. Marty on the other hand, preferred the fractionally wider soundstage and slight bass boost of the HR-120, finding the sax a touch more natural, but as he said, his setup (Arcam FMJ A22 & ATC A7T’s) is very clinical in it’s delivery, so the subtly warmer HR-120 would add character. Switching to Jazz From A Pawnshop, I found myself again drawn to the precision of the BluDAC, interestingly, with this recording the soundstage had the edge on the HR-120 for me. For the sake of being thorough, we listened to the same material using the optical out. Now there should be no difference over digital, the sound is processed by the DAC in the amp, but as subtle as it was, it was there. A blind test confirmed it. There was a fraction more precision and warmth coming from the HR-120…over optical. 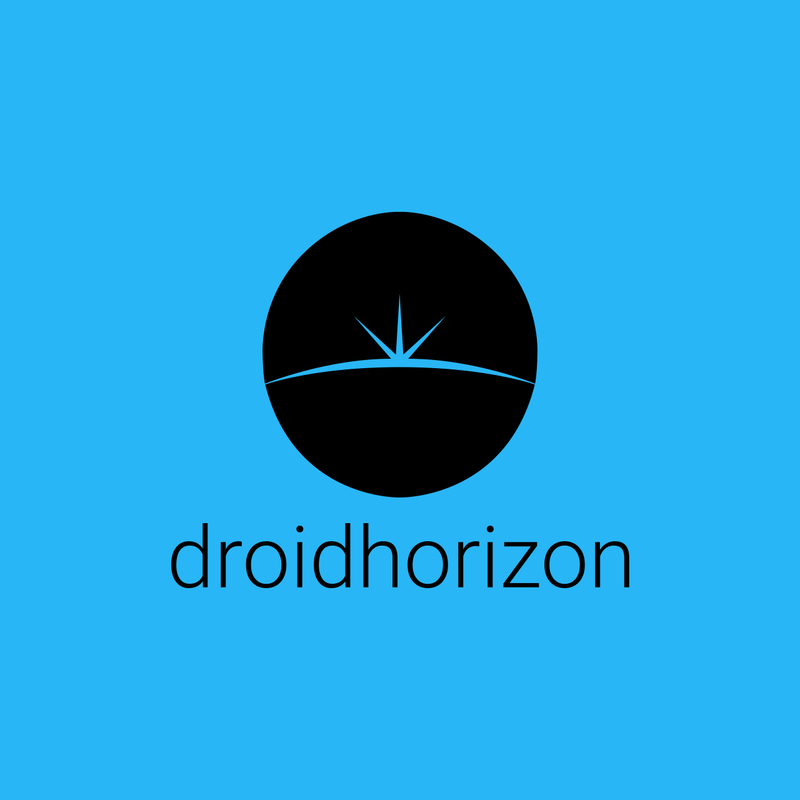 Curiosity got the better of me so I opened up both the BluDAC and HR-120…and got a bit of a surprise. 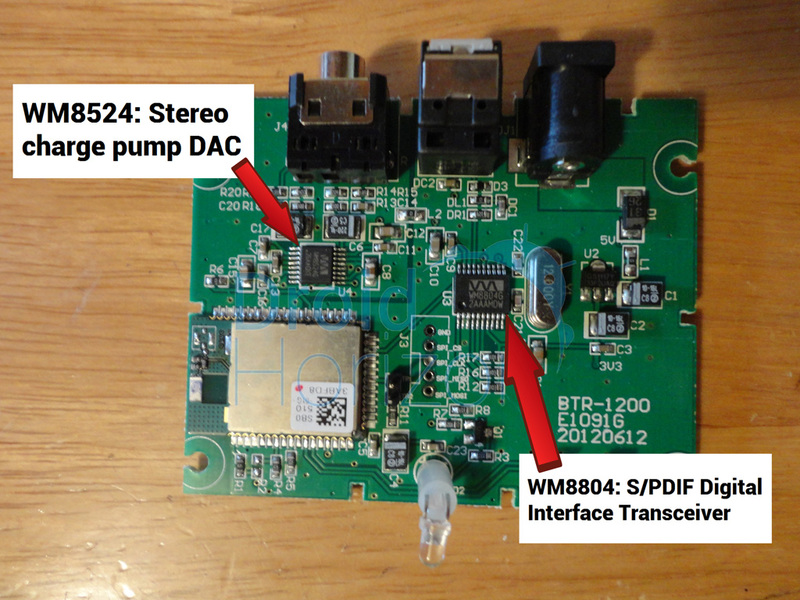 I knew which DAC was used in the BluDAC, a Wolfson WM8524 but the specs of the Betasphere were a mystery as no info is available online. With the exception of the LED the two boards are pretty much identical. Now bear in mind that we were consciously looking for differences, and those we found were very subtle. For me the BluDAC wins it though, the sound just really suits my setup, and the music I listen to. Build quality is great on both devices, but for those to whom aesthetics matter the BluDAC wins again, it simply looks better on my media stand. 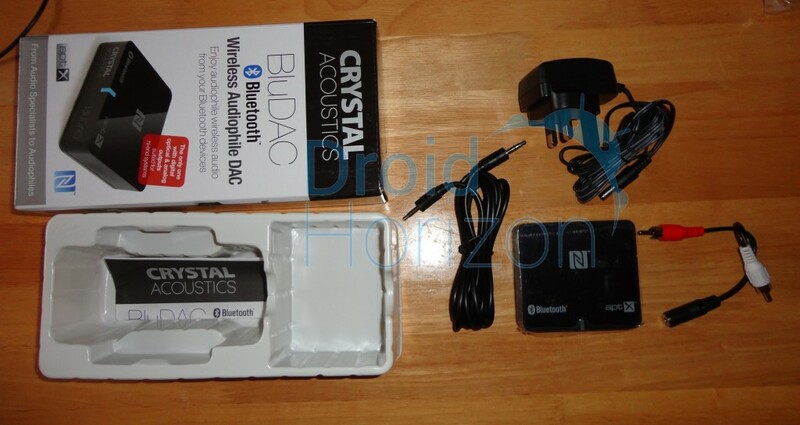 You can order one here Crystal Acoustics BluDAC and while you’re at it, have a look at what else they have to offer, a couple of things caught my eye while I was browsing their products. To get this kind of sound quality from your phone or tablet to your Hifi using only bluetooth, £60 is a bargain. 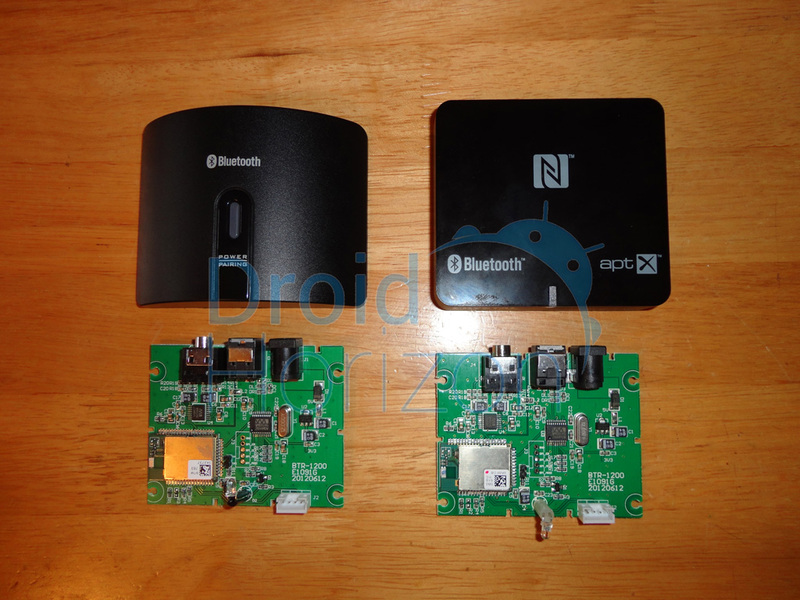 For some, the NFC support, which makes pairing ridiculously easy, will be the icing on the cake. 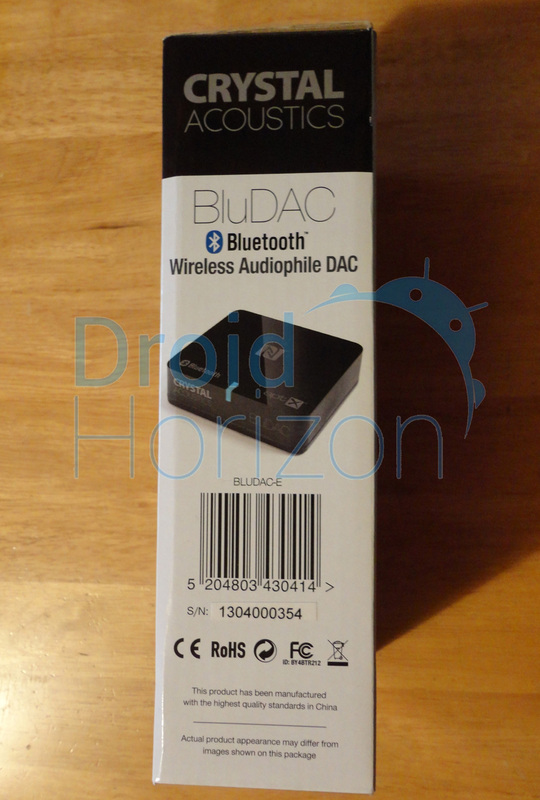 Either way I’d definitely recommend the BluDAC if you’re looking for a wireless solution for playing music from your Androids to your sound system, whatever it may be. What now for the Sony Smartwatch 3? The bluedac & HR 120 are exactly the same because they both come from the same mfg. Down to their serial numbers. Both use Wolfson dacs. Thanks for the review but neither are different. To believe otherwise even when you LOOKING at the evidence in front of you is a mind bender.